The prefecture emblem was adopted on May 3rd 1957 by Notice No 138. The flag was adopted on Sep 16th 1968 by Notice No 355. The flag proportion is 2: 3. 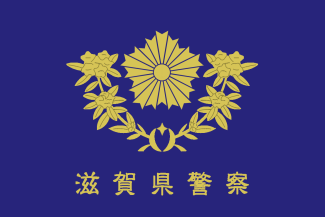 Adopted on Apr 1st 1989 by Shiga Prefecture Police Headquarters Orders No 5. A beige flag charged with a gold sun and rays with name in black hoist. The beige flag charged with a gold sun, rays and red horizontal stripe upper fly and title in black along the hoist.